The twenty three ‘Lullabies’ in this selection include the, mainly predictable, nocturnal nursery rhymes ‘Twinkle, Twinkle, Little Star’, ‘Rock-a-bye Baby’ and ‘Wee Willie Winkie’, the traditional ‘Hush, Little Baby’, ‘Star Light, Star Bright’ and ‘Brahms’ Lullaby’ together with a number of other lesser known rhymes and songs. 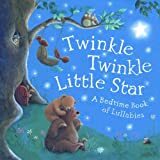 I can recall many of the tunes these rhymes are sung to but some are unknown to me and I suspect this will be the case for most readers so, it is a pity that there is no musical notation or a CD included. Dreamy blue and green hues diffuse Gail Yerrill’s detailed illustrations and borders depicting various wild animals from bumble bees to bears and caterpillars to carthorses, providing cosy bedtime scenes to explore.